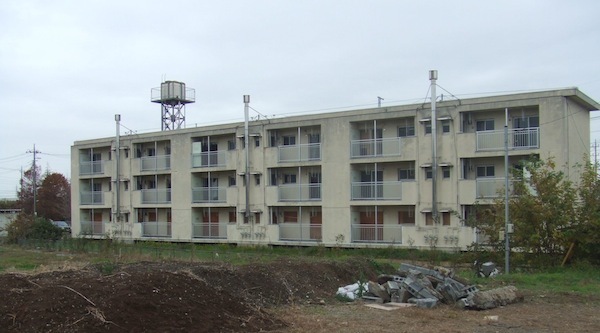 In April, the government decided to extend its subsidy for temporary emergency housing in the Tohoku region by one year. Originally, they allowed for two years, so that means people who are currently approved to live in temporary (kasetsu) housing can remain where they are until at least April 2014. Most of the media coverage of this issue centers on the new housing that was built specifically for the refugees of the March 11 disaster, but in truth most of the units being used for this purpose are existing houses and apartments that the government is leasing from their owners. According to Tokyo Shimbun, in Miyagi Prefecture alone, there are 26,000 minashi–units being rented from landlords–units in use and 21,500 specially built units. Not everybody was pleased when the government announced the extension. A group of people who own the land on which some of the temporary housing was built expressed concern that they wouldn’t be able to sell their land for another year, and are worried that the government could continue extending the period of habitation indefinitely, which is what happened in Kobe after the Great Hanshin Earthquake. Another dissatisfied group is an association made up of Miyagi realtors and landlords. One would think that landlords would be happy with the extension, since it guarantees income for another year, and probably at inflated rates since the government is paying. However, one Sendai realtor told Tokyo Shimbun that many of the refugees who are living in these minashi units are not homeowners who lost their houses but rather people who were renting apartments or houses that were destroyed or damaged. The realtor says that local governments assigned these renters to minashi dwellings “without properly checking their situations,” meaning, presumably, that the temporary housing program does not discriminate but it should, since there is a difference between renters and owners. Some “adjustment” (merihari) should have been made before the government decided to extend the program another year. Exactly what “adjustment” means in this case isn’t spelled out, but the only natural conclusion is that the renters should be evicted. A landlord explained the problem more clearly. He told the newspaper that he and his fellow property owners “cannot see [the former renters’] ability to pay rent on the units they now live in when the extension is over.” That implies that while the landlords are perfectly happy to take the government’s money while the program lasts, once it’s over they are afraid it will be difficult to kick the residents out if they don’t have the ability to keep up rental payments on their own. This situation once again points up the received wisdom that renters and homeowners belong to different classes, and that renters are considered to be inherently less reliable. However, there is no reason to think that homeowners who are now living in minashi temporary housing at the pleasure of the government won’t want to continue living there after the program ends; and who is to say they are any more financially solvent than renters? After all, many of them lost everything in the disaster, and based on reports so far the government isn’t going to reimburse them in full for their losses. The merihari discrimination seems to be an expression on the part of the ownership class to maintain some sort of status quo. We’ve already seen this mindset revealed in the reaction to renters receiving charity funds after the disaster. Homeowners were scandalized that renters were somehow eligible for the same amounts as they were, which was low to begin with, but it’s the principle of the thing, isn’t it? These discontents wouldn’t accept the fact that this was charity and that it had nothing to do with the amount of property lost (though, for sure, renters lost property too in the form of possessions) but was simply money to help them get through the worst of it. Homeowners have been conditioned to think that they are privileged. But maybe that’s not exactly what the Miyagi realtors had in mind. The Sendai agent told Tokyo Shimbun that public tax money is now being spent to house refugees in temporary minashi units, so it’s beholden on the government to “check each individual” and decide on whether or not an extension should be made for that individual. Following his remark about renters not being the same as homeowners, maybe he is hoping that the government will ask these renters to leave, thus creating a potential customer base for him and other real estate agents. After all, realtors make money on the deals that are made when people buy or rent, and though some of them may have made money brokering deals with the government for the minashi units, they can make the same money again when they broker deals with evicted renters, maybe even for the same units.